If one were to take a guess as to the strongest asset class for investment, considerations such as fine art, rare wine or blue-chip stocks might come to mind. Investment banking powerhouses across the country have long had client portfolios chocked-full of traditional-based instruments, all confident that the strategies will yield handsome returns. Yet, the starlet of the investment stage is not precious stones, rare coins or even Big Board stocks — it is a heroine of a different breed, and one that might surprise many: classic cars. Ten years removed from the chill of the frozen economy, investment strategies are beginning to become clear. Rare watches have appreciated 65 percent; fine art has appreciated 130 percent; and precious jewels 147 percent. The Dow Jones has yielded an impressive 215 percent return. However, these returns pale in comparison to the 404 percent return the collector car market has achieved during this same time period. 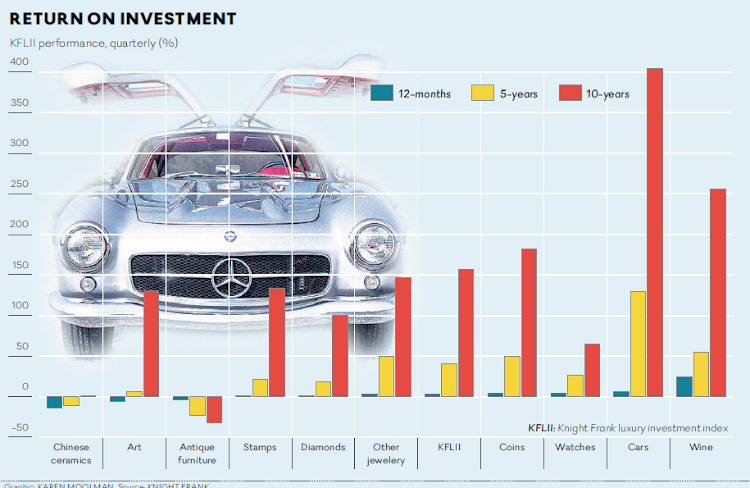 Classic cars as investments have become so significant that the Dow has created the “Dow Jones Investment-Car Index,” a comparison of 50 collector cars and their results over a 10-year period. In fact, German bank Suedwestbank AG is recommending that its high net worth clients add collector cars to their investment portfolio, noting that the investment class has significantly outstripped Germany’s main stock index, the DAX. If the Ferrari 250 GTO sounds like an anomaly, it is not. In 2013, RM Auctions sold a Ferrari F50 for $800,000. In 2017, the auction house sold essentially the same car for $3.1 million. And if Ferraris have stolen the show, Porsches have taken the whole darn auditorium. In the last 10 years, classic Porsches have increased an astonishing 683 percent. What is particularly significant about this is that, unlike Ferraris which have become stratospheric in their pricing, classic Porches are still relatively affordable. Endearingly dubbed the “poster effect,” children of the 1970s and 1980s who have now hit full earning potential stride are buying the cars they had posters of when they were kids, and the market reflects it. Porsche 911s from the era are becoming scarcer than a sunny day in Seattle, and muscle cars are not far behind. The Dow Jones Investment-Car Index reports that the 1970 Plymouth Hemi ‘Cuda has a 10-year increase of 500 percent. What is particularly interesting is the resiliency the market has had through challenging times. Take for instance the 1958 Ferrari California, the car made famous as the Ferris Bueller car that suffered a fateful ending. In 2005, the average price was $1.5 million. By 2015, 10 years later, the average price had climbed to $14 million, an 850 percent increase — and this is through the recession. In fact, according to WMG Advisors, collector cars are the only asset class that that actually rose in 2008, when all other assets were in a freefall. The market is so stimulating that even the Vatican is getting in on the game. In 2015, the sovereign nation sold the Pope’s Enzo Ferrari for $6 million, and last year the Supreme Pontiff’s Lamborghini Huracan sold for $1 million — the proceeds of which were donated to charity. Next month will mark the 68th annual Concours d’ Elegance — a gathering of the world’s most important collector cars on the famed Pebble Beach golf links. The weekend is dotted with champagne parties at spectacular seaside mansions, put on by Rolls Royce, Aston Martin and the likes for their special clientele; but the stars of the weekend are the elite collector car auctions that attract collectors — and investors — from around the world. The auctions are a sight to see, attracting a sub-culture of pedigreed car collectors who most were unaware even existed. Registered bidders come from some 30 countries, with the intent of buying, selling or closely watching some of the rarest cars in the world. Last year, $328 million of collector cars were sold over the three-day weekend. With numerous cars crossing the $1 million threshold, the Pebble Beach weekend marks one of the most explosive microcosms the world has ever seen. To put the event into context, consider that the auction houses fetch 10 percent of the transaction price from the buyer and the seller — $65 million for the weekend — and you start to get an understanding of the economics at play. Last year, the star of the show was a 1956 Aston Martin DBR1 that sold for $22.6 million, followed by a 2016 Le Ferrari that sold for $7 million. The Le Ferrari sale was particularly interesting, given that the car sold new the prior year for $1.4 million, some $5.6 million less than the auction price. And demonstrating the pure mania of the day, another 2016 Le Ferrari sold for $10 million at an RM auction the following month. The market isn’t even waiting for them to become classics. If the retail side of the automotive industry has seen a return of confident buyers, the classic car industry has exploded with enthusiasm. With their million-dollar price tags, classic cars attract financial moguls who tend to be smart with their dollars. For those with the industry specific know-how, fortunes are there to be made in a New York minute in an industry that is bristling with hyperactivity.